Holmes Beach police arrested a former president of the Anna Maria Island Chamber of Commerce for alleged child abuse. Deb Wing, 53, of Holmes Beach, was arrested at 11:56 p.m. April 4 following an argument in which she’d slapped a family member in the arm and leg “so much” that Wing had to be restrained by another person, according to the reports from two HBPD officers. 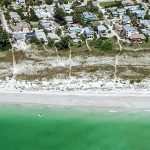 A witness told police the argument took place while the family member was in bed at the Harrington House Bed and Breakfast Inn, 5626 Gulf Drive, Holmes Beach. Police suggested a third-degree felony charge of child abuse, although formal charges are pending review by the 12th Circuit State Attorney. Wing reported the family member missing from the inn, where they reside, at 11:10 p.m., and Officer Mike Walker and Sgt. Brian Copeman responded at 11:12 p.m., according to their reports. The witness told police the argument occurred about an hour before police were called. While police were interviewing Wing, the witness to the incident located the subject in a parking garage at a nearby condominium. Another family member was contacted to take the subject, according to reports. Wing began working for the chamber in 2009 and served as the chamber president May 2015 to December 2017. 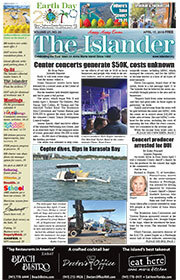 In asking The Islander to have the article and her mug shot withheld, Wing disputed she is a public figure on Anna Maria Island. “Not anymore,” she said. At press time, The Islander was unable to confirm details with either the Florida Department of Children and Families or the state attorney’s office. It would, however, be up to the SAO to review the case and file charges. DCF oversees the safety of the minor. “In Manatee County, all child protection investigations are conducted by the Manatee County Sheriff’s Office, not DCF,” according to Natalie Harrell, communications director, SunCoast Region Florida Department of Children and Families. After Wing’s arrest, she was transported to and booked at the Manatee County jail. Wing posted a $500 bond and was released, according to the jail website. Wing’s arraignment is set for 9 a.m. Friday, May 4, at the Manatee County Judicial Center, 1051 Manatee Ave. W., Bradenton. Can spanking become child abuse? While parental discipline is not per se illegal, unreasonable or excessive hitting, slapping or otherwise causing harm to a minor may cross the line — but spanking? There’s also misdemeanor child abuse, domestic violence and a host of battery charges. Harm includes physical, mental and emotional injuries. Not only are legal definitions a bit murky, not all attorneys agree. Case law seems to turn on whether parental actions are reasonable or excessive. A 2002 Florida Supreme Court case recognized a typical spanking as “reasonable,” distinguishing it from another case where a father punched a child for failing to do yard work, pushed him down and kicked him while on the floor. In a 2011 case, a 1st District Court of Appeal three-judge panel ruled a father’s actions — holding a daughter’s arm hard enough to leave a mark and smacking her buttocks after the child became disrespectful at a dinner table — didn’t amount to abuse. Lombardo added, “This is the law when it comes to parental corporal punishment. It is a very high bar for law enforcement and the state attorney to meet.